166 pages | 3 B/W Illus. Applying Indigenous Research Methods focuseson the question of "How" Indigenous Research Methodologies (IRMs)can be used and taught across Indigenous studies and education. In this collection, Indigenous scholars address the importance of IRMs in their own scholarship, while focusing conversations on the application withothers. 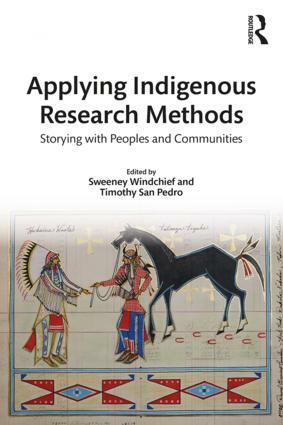 Each chapter is co-authored to model methods rooted in the sharing of stories to strengthen relationships, such as yarning, storywork, and others. The chapters offer a wealth of specific examples, as told by researchers about their research methods in conversation with other scholars, teachers, and community members. Applying Indigenous Research Methods is an interdisciplinary showcase of the ways IRMs can enhance scholarship in fields including education, Indigenous studies, settler colonial studies, social work, qualitative methodologies, and beyond. Sweeney Windchief is a member of the Fort Peck Tribes (Assiniboine) in Montana and is an Assistant Professor of Adult and Higher Education at Montana State University, USA. Timothy San Pedro is Filipino-American and grew up on the Flathead Indian Reservation in Western Montana. He is an Assistant Professor of Multicultural and Equity Studies in Education at The Ohio State University, USA.